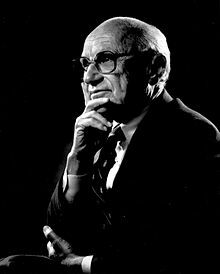 ^ "Milton Friedman". c250.columbia.edu. Retrieved 2019-03-07. ^ "Professor Emeritus Milton Friedman dies at 94". www-news.uchicago.edu. Retrieved 2019-03-07. ^ Milton Friedman (1955). Robert A. Solo, ed. "The Role of Government in Education," as printed in the book Economics and the Public Interest (PDF). Rutgers University Press. pp. 123–44. Archived (PDF) from the original on May 10, 2017. Retrieved February 12, 2017. ^ Kristula-Green, Noah (2012-07-31). "Milton Friedman's Unfinished Legacy". The Daily Beast. Retrieved 2018-09-25. Steelman, Aaron (2008). "Friedman, Milton (1912–2006)". In Hamowy, Ronald. The Encyclopedia of Libertarianism. The Encyclopedia of Libertarianism. Thousand Oaks, CA: SAGE; Cato Institute. pp. 195–97. doi:10.4135/9781412965811.n118. ISBN 978-1-4129-6580-4. LCCN 2008009151. OCLC 750831024.